Once complete, Expedition Asia will provide guests with a world-class experience; immersing community members within the animals’ native forest habitat. Numerable vantage points and animal encounters will greet guests as they wind through iconic Asian architecture and landscaping to rediscover everything they love about these amazing animals. Better care for our animals and guests. Expedition Asia will strengthen Sunset Zoo's ability to provide modern animal care and guest experience. Learn about the need. A design that moves the Zoo forward. Expedition Asia is more than just a facelift; it will revitalize this portion of the zoo. Check out the design in full detail. Tigers, sloth bears, leopards, oh my! This project will give you a front-row seat to connect with amazing animals. Learn more about them. Give $13, donate now to Expedition Asia. Your tax-deductible gift builds upon a legacy of community engagement at Sunset Zoo and ensures excellence with animal care and guest experiences. Donate now to Expedition Asia. 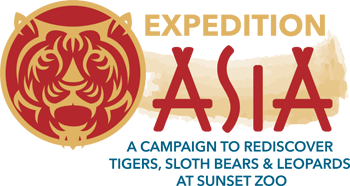 Several levels of naming opportunities are available with Expedition Asia, as well as the ability to pledge major gifts over multiple years. To find out how you can be a part of this transformational project, contact Rachel Herrod, Marketing and Development Officer, at 785-587-2737 or rachel.herrod@cityofmhk.com.